7th Workshop on "Decommissioning of Installations and Site Remediation"
The 7th EAN Workshop was devoted to decommissioning and site remediation. 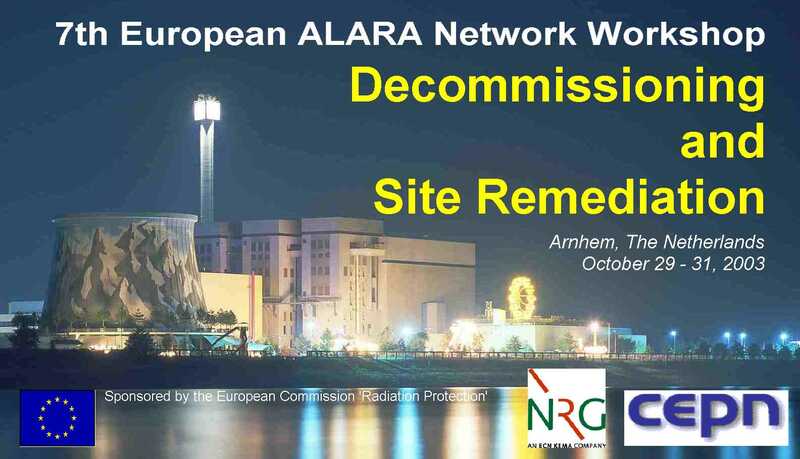 This was the first time that a workshop re-visited a specific topic: the 1st EAN Workshop (Saclay, 1997) was devoted to ALARA and decommissioning. The main objectives of the workshop were to provide a means of reviewing the recommendations of the first Workshop, progress made in the application of ALARA in decommissioning and the remaining needs both in the nuclear and non-nuclear sectors. Effectiveness and feedback from the use of dose and dose rates estimating factors. The opening session reviewed the progress made with the recommendations from the 1st Workshop, and identified a series of issues and questions for later consideration in the Working Group sessions.